Sometimes it’s the little things – the really little things – that make all the difference in our day to day lives. I’m always asked about the kind of baking equipment I use; people assume that because I’m an avid baker that I have an extensive and fancy collection of tools and gadgets. Nope. As I mentioned in my post about my Grandma Fay, I use all of her old pans and baking sheets. Yes, I have a nice mixer. And way too many cookie cutters. But for the most part Fay’s sheets and pans serve me well. They’re light, sturdy and the perfect thickness for turning out lovely cookies, brownies and cakes. What they are NOT is non-stick. So I always line my baking sheets and pans with parchment paper. Parchment paper is different than waxed paper – it can withstand much higher oven temperatures and is coated with silicone, which makes it non-stick. Parchment paper is great for other uses too – you can make paper “cones” to fill with royal icing for piping on cakes and cookies (click here for a great video on how to do it). You can use it to create packages of fish or vegetables, for cooking “en papillote”. And you can roll pie and cookie dough between the sheets, eliminating the need for extra flour to keep it from sticking. But I use parchment most often to line my baking sheets. Unfortunately the width of a standard roll is larger than a conventional sheet, so I always wind up having to trim the paper. In addition, the paper, having been on a roll, is usually curved and won’t lie flat on the sheet. Small problems, I know, but when I’m baking I like to keep things moving along. Enter………….pre-cut parchment sheets! I don’t know how I missed this one but I will NEVER not have these in my kitchen! The sheets are the same size as a standard baking sheet and come 100 to a package. In addition, they are biodegradable and compostable. Baking cookies? 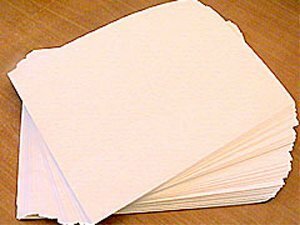 Prepare multiple batches on several sheets of paper. Slide the paper with the cookie dough right on to your baking sheet to bake. When the cookies are done, slide the sheet with the cookies on it right on to your racks to cool. Get pre-cut parchment sheets here. Do you have a can’t-live-without baking or cooking “helper”? Please share it here; it may show up in a future favor – “ette” Friday! Wondering what favor-“ette” means? Click here! I don’t think I could survive without these pre-cut sheets! I’m also a fan of pre-cut parchment circles, it’s a major time saver if you bake a lot. BTW – I buy them from here, better price than the link above – http://www.culinarydistrict.com/Products/Paper/PARCHMENT-HALF-APPX-250. Thanks Sara! And thanks for the link – prices are MUCH better! I also love the pre-cut aluminum foil called “wrappers”. So convenient, so indulgent! Oooh – where do you get those? Can you send the link? Thanks! Sheri, these are great! I’ve been using them for years. In fact, I sell them on my kitchen website, cassandraskitchen.com, in a variety of sizes. Here’s the link: http://store.cassandraskitchen.com/parchmentbakingsheets.aspx. Happy baking! I’m so glad you included the link – I’ve got to buy some of those pre-cut round sheets! So much less wasteful!